Unfortunately that aspect of history has remained murky more than 115 years after Andres Bonifacio was executed at the height of the Filipino rebellion against the oppressive Spanish colonizers. 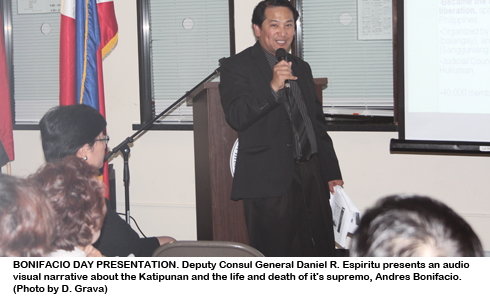 In an audio-visual presentation during that consulate event, Deputy Congen Daniel R. Espiritu brought into focus that very contentious issue surrounding the death of the Philippine hero. Although the president was referring to attempts by some misguided segment of Philippine society to make the 15-year-long martial rule of dictator Ferdinand Marcos look good, the same revisionism is true in the case of Bonifacio’s death considering that the main culprit was no other than his rival in the Katipunan leadership who subsequently became the first president of the Philippine republic. Emilio Aguinaldo undoubtedly had the motive and influence to make that sordid episode of our history inaccurate (sanitized?) as taught in the classrooms and in its retelling to the people. In a document historian Teodoro Agoncillo affirmed a signed statement of Aguinaldo dated March 22, 1948 accepting responsibility for ordering the execution of the Bonifacio brothers, Andres and Procopio. However, Aguinaldo also asserted that he commuted those death sentences but was prevailed by members of the Council of War Generals Mariano Noriel and Pio del Pilar to proceed with the execution otherwise they supposedly risked the disintegration of the revolutionary government as well as their own lives. The following is an excerpt from The Autobiography of Gregoria de Jesus translated by Leandro H. Fernandez published in The Philippine Magazine dated June 1930: “They fired a volley at my husband, and when he fell they stabbed him and struck him with the butts of their guns. My brother-in-law Ciriaco was seized by two and shot to death. Procopio they tied and beat, with a revolver. They then placed the wounded in hammocks, and those they had bound, and took them to the pueblo. When they saw me come out of the place where I had been hiding, the officers of the detachment ran towards me and tried to compel me to say where the money of Cavite or of the treasury was kept; they also took by force my revolver and even what little expense money we had. Then they hastened to tie me to a tree, attempting to force me to tell them the whereabouts of the money which they said we had collected.” Gregoria, whose Katipunan nom de guerre was Lakambini, was the wife of Andres Bonifacio. Mabini went on to declare that such act of hatred caused the loss of morale among many of those involved in the revolutionary movement which soon after withered and was defeated. Aguinaldo’s government didn’t last long and officials went into hiding in the dense forest of Biak-na-Bato mountain. Aguinaldo agreed later on to be exiled after calling on his fellow revolutionaries to surrender to Spanish authorities in exchange of 400,000 pesos in bribe money. Mabini also accused Aguinaldo of having masterminded the assassination of another rebel leader, Gen. Antonio Luna. “With Luna its firmest support, the revolution fell, and the ignominy of the fall, weighing entirely upon Aguinaldo, caused his moral death, a thousand times bitterer than the physical one; then Aguinaldo ruined himself, condemned by his own actions. That is the way Providence punishes the great crimes,” Mabini wrote. The way Luna was lured to the place of his execution eerily echoes the manner Bonifacio was enticed to leave Manila and visit Aguinaldo’s turf in Cavite. In his memoirs first published by the National Heroes Commission in 1963, Gen. Artemio Ricarte wrote: “the latter (Aguinaldo’s Magdiwang faction) frequently communicated with him, EACH TIME INSISTING MORE AND MORE ON THE INVITATION WHICH IT EXTENDED THREE TIMES… On the third invitation, Bonifacio acceded to the petition of the Magdiwang government and came to Cavite province in December 1896, before the Christmas season.” When he arrived Aguinaldo was also nowhere around.